At OLEA in Newport, you’re just as likely to hear a Hall & Oates song as you are to drink a cocktail named after one. “Have you ever dialed the Callin’ Oates song helpline?” I ask Gabe Whorley, one of the partners behind the bar. “Nah, never heard of it, but I can’t resist putting classic yacht rock on our playlist. . . . It’s what we listen to while out on the boat,” he confesses. She’s a rich girl! A citrus and rosé snow cone of a cocktail. Photo by Greg Nagel. One thing I can’t resist is the best-selling, aptly named cocktail Rich Girl (yes, after the Hall & Oates song). Blue-haired bartender Inga Tantisalidchai scoops a snow cone of shaved ice into a glass; adds vodka, rosé, yuzu and lime; shakes it all together; then strains the concoction over ice. The well-manicured lady next to me at the bar drinking a vodka-Pellegrino is wowed. “What’s that?” she asks. “It’s a vodka drink called Rich Girl,” I reply. “Ooh, just like me,” she says, batting her lashes. Oh, Newport. 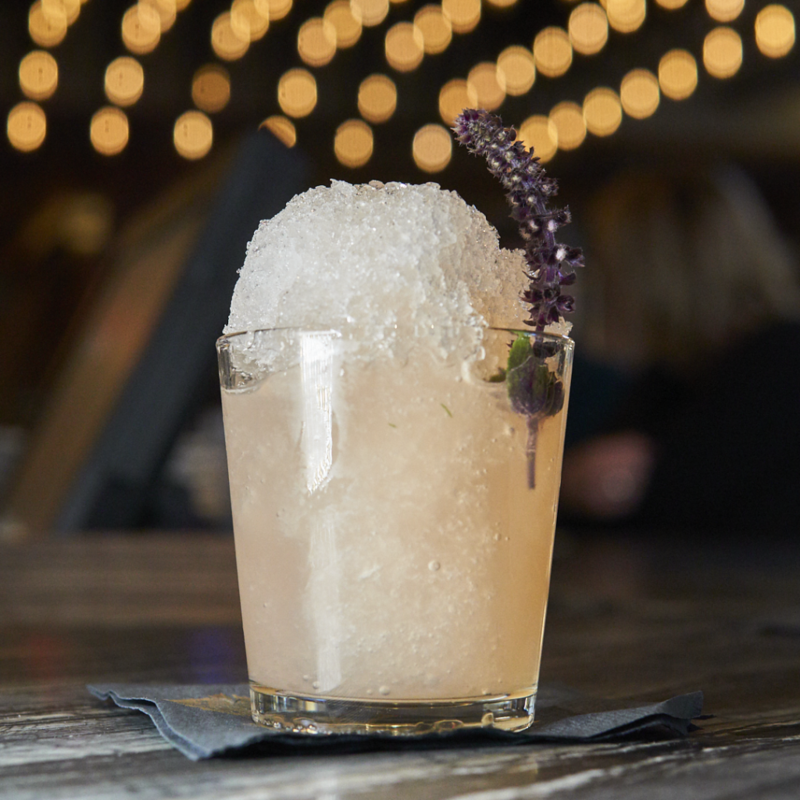 The drink is as easy to consume as yacht rock and is sort of like a rosé-drunken snowman. 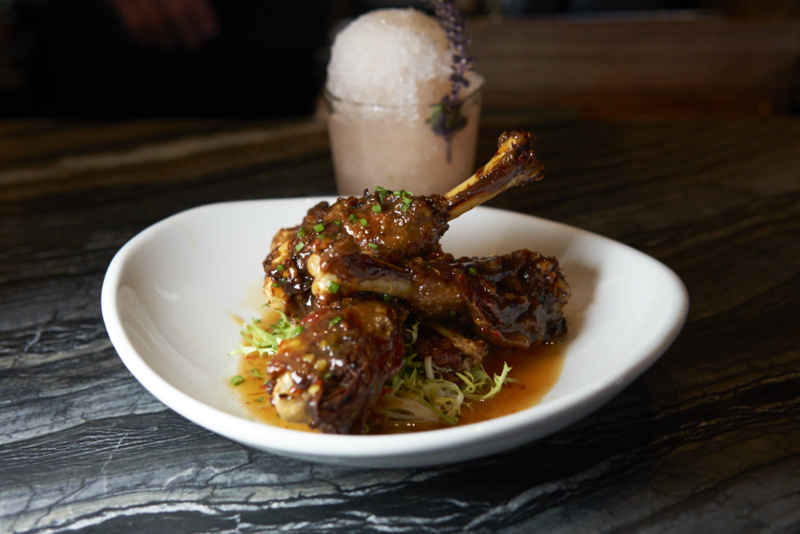 The perfect match for Rich Girl is undoubtedly OLEA’s signature Meyer lemon duck wings, which are confited and cooked to a crisp, then glazed to perfection. I thought they would be an overly unctuous affair, but they arrive like steamy Cuban Mojo wings: tender, meaty and bursting with citrusy flavor. Chiles and chives balance out the plump morsels, which are easily a gateway drug to the rest of the menu. Curiosity hits as I eye the Chef’s Cocktail on the menu. “This month’s is called Surf’s Up,” notes Tantisalidchai. It’s sort of a take on an Irish coffee, yet it’s rooted in all things Newport. 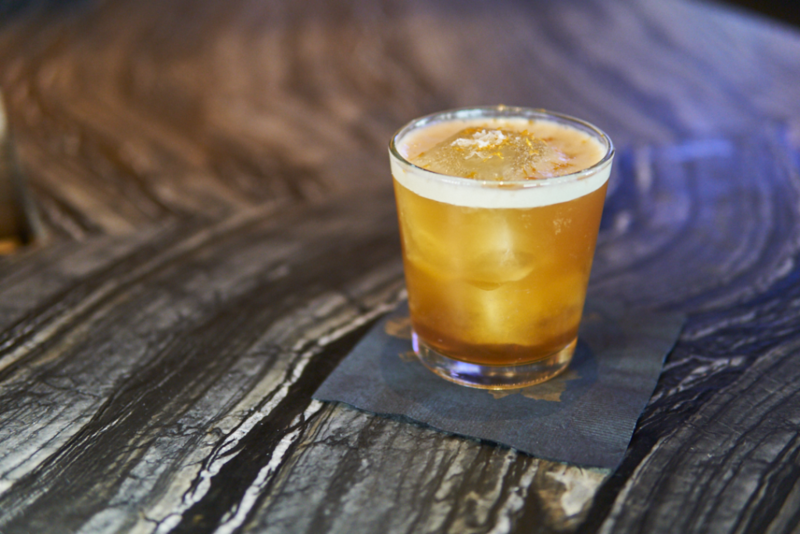 “It’s got Jameson Black Barrel; Clement Mahina Coconut Liqueur that sort of represents our sun-tan vibe; chilled espresso because of all of our local coffee culture; sea salt, as the ocean is close by; and a little orange zest because of Orange County,” she adds. 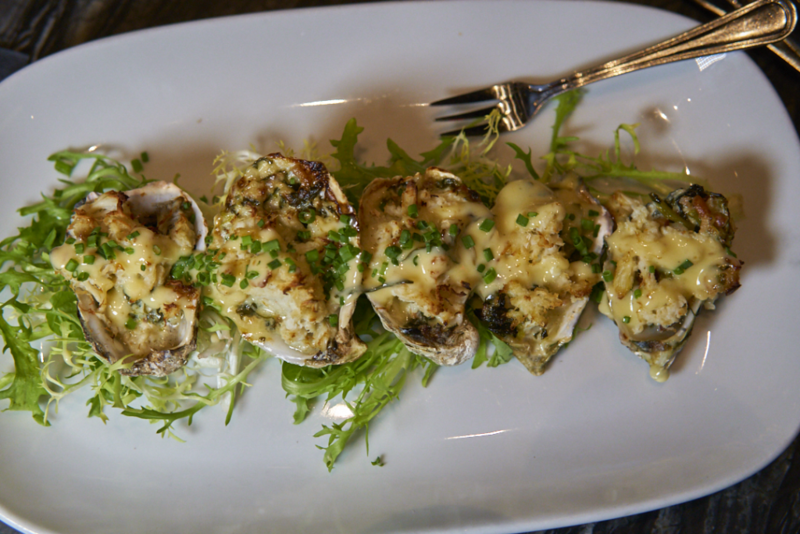 The baked oysters here are not to be missed. Sweet blue crab and smoky Nueske bacon top the salty bivalves, making every last drop an easy excavation from the pearly treasures. The lady next to me eyeballs the dish, which is steaming with aromatic Champagne tarragon butter. Do I offer one? “I’m sure she can afford her own,” I think to myself, politely. 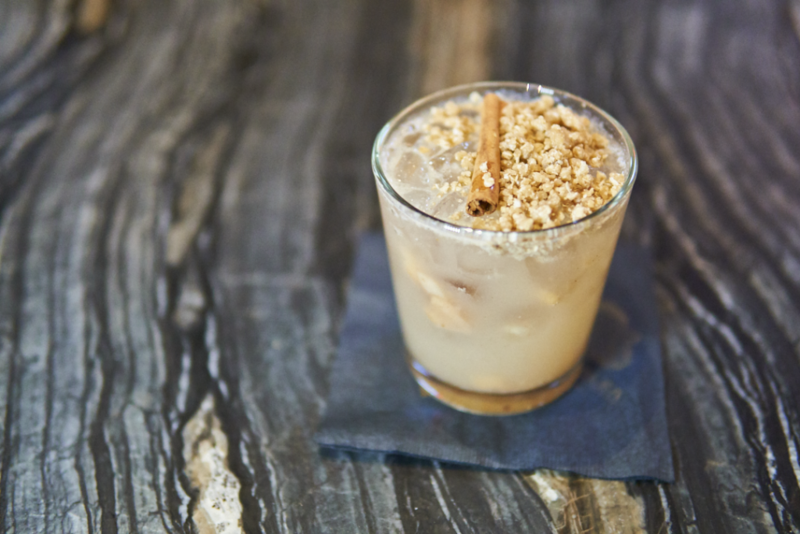 Tantisalidchai has another trick up her tattooed sleeves, a secret cocktail called Apple of My Pie, which mixes vanilla vodka with house apple-pear-riesling compote, topped with desserty oatmeal crumble. You can find Tantisalidchai’s secret drink menu on her Instagram @cocktailsbyings. OLEA, 2001 Westcliff Dr., Ste. 100, Newport Beach, (949) 287-6807; oleanewportbeach.com.